By the end of 1917 the Gotha G.IV and G.V were the principal German strategic bombers. During raids over the enemy's territory, engine failures were quite common; as a result, these heavy twin-engined machines often returned to their home base with only one working engine. This caused control problems and led to frequent accidents. In February 1918 Gothaer Waggonfabric AG tested a new version of the latest G.V bomber with a new box tail ('Kastensteuerung'); Gotha reported that aircraft with the new tail assembly could fly in a straight course with just one working engine. Apart from the new tail, the Gotha G.Va had a slightly smaller nose section with a two-wheeled auxiliary shock landing gear mounted underneath (similar to the SSW-type 'Stossfahrgestell', designed for the G.IV SSW). 25 aircraft of this type were built, all (except for one machine which crashed during flight trials) going to Bogohl 3. Later aircraft were equipped with a four-wheeled auxiliary undercarriage beneath each engine nacelle for increased efficiency. This version, the Gotha G.Vb, also had Flettner servo controls on its ailerons to reduce the pilot's work load when flying with one working engine. Idflieg ordered 80 planes, the first being delivered to Bogohl 3 in June 1918. By the end of the war all 80 aircraft had been built, but the last batch did not reach the front and was delivered directly from the factory to the Allied special commission. As of 1st September 1918, only four bombers of the G.Va type and twenty-one of the G.Vb type served in Bogohl 3. Along with other night bombers every G.Va and G.Vb was destroyed after WWI ended. Thanks to the Roden website for the historical information. This is the fourth large Gotha bomber in 1/72 that has been produced by Roden. As always, there are some common sprues between them and as a result there has been a bit of flash introduced. Though not shown on the above image (borrowed from the Roden site), both of my upper wings had flash on the trailing edges. Some flash was also on the fuselage sprue, but not to the extent of what was on the wings. Mercifully, the two upper sprues with all the really fine bits was free from any molding glitches. As you may guess, some of the parts are not used on this particular variant. The kit itself is molded in Roden's usual medium grey plastic and it is a bit on the soft side as has become more the norm with models. The amount of detail in this kit is truly incredible as you can see from the very large number of small parts. The kit says not for children under 3 and I think that should be amended to add 'or those with fumble fingers' as some of the bits are truly small. You get a really complete kit with detailed cockpits, bomb area and gunners positions. Also well detailed are the engines and the landing gear. This kit is definitely not for the newbie to WWI modeling as there are a plethora of struts and braces. It also benefits greatly from rigging and there is a complete rigging diagram provided. Patience and a good jig are what this kit will need. Gotha G.Va w/n 723/17, German Air Force, spring summer 1918. This aircraft has the large dragon on the side and a white nose. It was shot down during raid over France on July 5,1918. 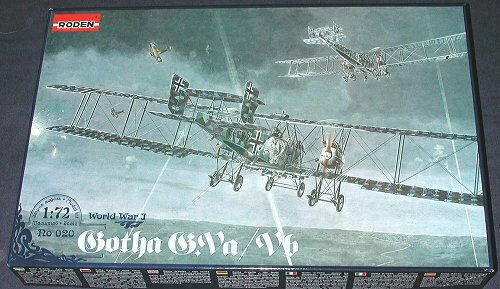 Gotha G.Vb w/n 917/18, German Air Force, summer 1918. Decals are superbly printed and quite glossy. 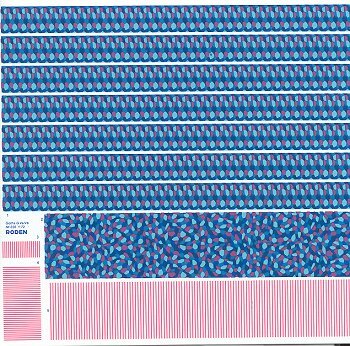 Roden has had mixed reviews on its decals and I can only hope that these will work well as finding 1/72 bomber lozenge decals may not be easy. 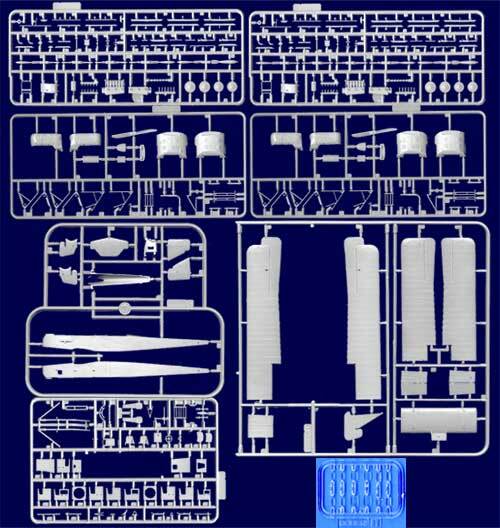 The instructions are excellent and provide a superb guide to building and painting the model. Colors are provided in Humbrol references and generic names.